Today in Masonic History Theodric Romeyn Beck is born in 1791. Theodric Romeyn Beck was an American physician and author. Beck was born in Schenectady, New York. He graduated from Union College at age 16. He would go on to Columbia University College of Physicians and Surgeons, graduating with a Doctor of Medicine at the age of 20. In 1813, two years after Beck had returned to Albany to start a medical practice, he submitted a paper to the Albany Society of Arts regarding the mineral resources of the United States. In 1815, Beck would be appointed professor of the institutes of medicine, and lecturer on medical jurisprudence in the College of Physicians and Surgeons of Western New York. He would become a leader in medical jurisprudence. Medical jurispurdence is the study and use of medicine and science to solve legal issues. In 1817, Beck would beomce the principal of the The Albany Academy. The Albany Academy was a day school for boys started in 1813. 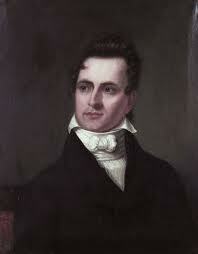 There he would influence many young minds including Joseph Henry, the future curator of the Smithsonian Institution. Before he would leave the post in 1848, he would also serve as a professor of medical jurisprudence at Fairfield Medical College from 1826 to 1836. He would also serve as a professor of materia medica both at Fairfield College and Albany Medical College. In 1823, while Beck was serving as the secretary of the Society for the Promotion of Useful Arts (SPUA), he founded the Albany Lyceum of Natural History. The purpose of the Albany Lyceum of Natural History focused on the preservation of mineral and botanical specimens collected in New York State surveys. Also in 1823, Beck wrote his most well known work Elements of Jurisprudence. In the book, Beck wrote information on the foundations of forensic sciences, posions and medicines. In 1829, Beck was chosen as President of the New York State Medical Society. At the same time he would become the manager of the state lunatic asylum. Lunatic Asylum's of the time included not only the mentally ill, it contained individuals with physcial infirmaties such as the blind, the deaf and the mute. While the manger for the asylum, he would collect statistics on deaf-mutes. He would use that infomration to influence the legislature to pass laws for the education of the mentally ill.
Beck passed away on November 19th, 1855. He would pass away from arteriosclerosis, a hardening of the arteries that had claimed, Beck's brother 4 years before. Beck was a member of Masters Lodge No. 5 in Albany, New York.